Women with long hair always stand out in the crowd with their cool femininity and stunning beauty. They differ from the rest with their luxurious charm provided by their eye-catching hairstyles and more often with hair color choices and highlights. However, it’s always important to take proper care for long locks to make them healthier, shinier and nicer. Since hair trends tend to change by the time here we represent the best hair highlights for long hair to give you new ideas on how to add more shine to your luscious tresses. 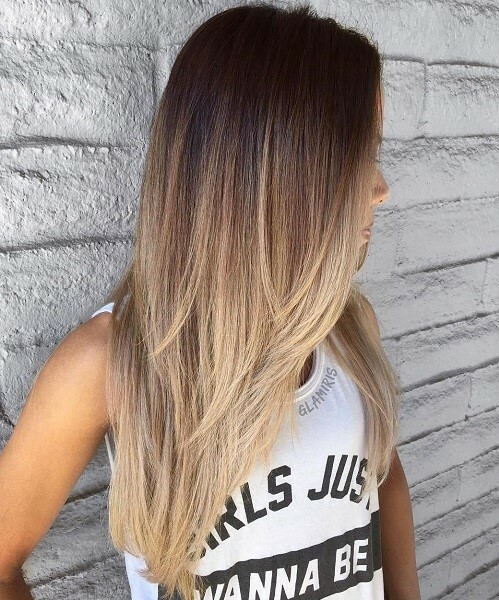 Although ombre is not a new hair color or highlighting idea in the fashion world it continues to stay one of the most required hair color ideas for long locks. Ombre is an awesome way of keeping the roots in your natural dark shade and lightening up only the tips starting from the mid-length of hair. 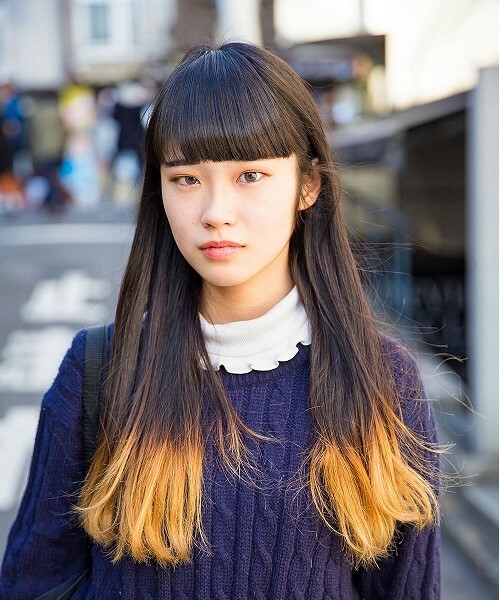 This hair highlighting or coloring idea is perfect for long hair. Recently we see reverse ombre styles with light roots and darker tips. You can also try the new somber styles, which are the softer solutions for ombre. The next luxurious hair highlighting trend that continues to be so popular among long-haired beauties is the lovely balayage. It’s the softer version of ombre that looks more natural and elegant. This highlighting trend is for girls who want a bit of change and not more. It is very attractive in warm hues like caramel, light brown, golden brown, sun-kissed blonde and golden blonde highlights. If you have naturally light hair you can add shiny sandy blonde or golden blond balayage highlights. 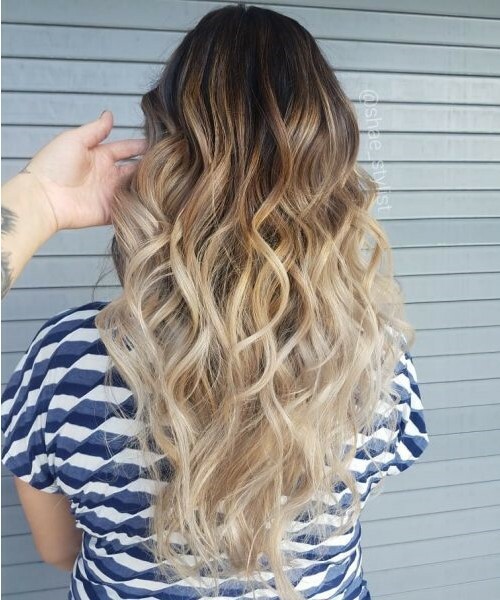 The best effects of balayage are seen on long wavy hairstyles. Both long and short haircuts allow us to play with the dip dye trend but it is bolder and more eye-catching on long and straight hairstyles. If you have long hair then give a try to this unique style. It’s the idea of highlighting on the tips of hair with a light hue. So, if you are a brunette who is tired of the same monotone shade you can highlight the tips with caramel, brown or golden shades. Nowadays, many brave women experiment with bolder hues like pastels, neon and rainbow. 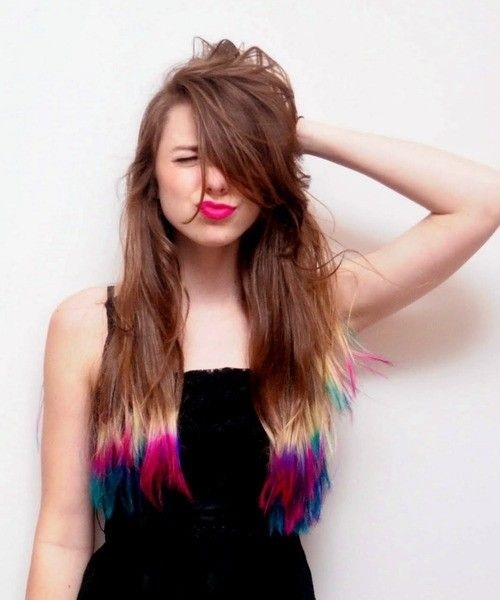 Find and create your own style of dip dye for long hair. Many long-haired celebrities have found the subtlest highlighting idea. It’s the slicing style with thin, natural-looking and soft highlights in light shades. Choose a color two or three tones lighter from your natural hair color and ask your stylist for slicing highlights. This is a great solution especially for super straight strands. It is very beautiful on sleek hairdos including updos. You don’t need additional styling tips to bring out the beauty of these hair highlights. They are fresh and stylish. You can take examples of best slicing highlights from celebs like Olivia Palermo and Alessandra Ambrosio.